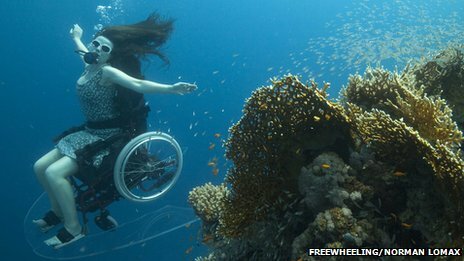 Artist Sue Austin is preparing to show off a prototype self-propelled underwater wheelchair to the public. Ms Austin, who has been a wheelchair user since 1996, developed the chair with help from dive experts and academics. The model is powered by two dive propulsion vehicles and steered with a bespoke fin and foot-operated acrylic strip. She is staging a performance with it in a swimming pool in Weymouth this week. "Creating the Spectacle" forms part of the Cultural Olympiad celebrations. Ms Austin, from north Devon, says she first had the idea after learning to scuba dive in 2005. "When we started talking to people about it, engineers were saying it wouldn't work, the wheelchair would go into a spin, it was not designed to go through water - but I was sure it would," she told the BBC. It was built with funding from the Arts Council's Impact Scheme. Finding a suitable dive propulsion vehicle to propel the chair was initially difficult because most propeller models were designed to be hand-held and Ms Austin lacked the strength to hold on to them. 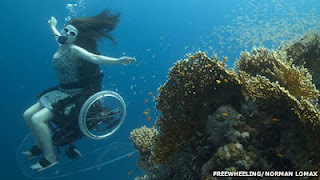 Eventually she trialled a model that was designed for divers with disabilities - and then added two to the wheelchair. Ms Austin bought an NHS wheelchair for the project and spent months with her team perfecting its buoyancy. She initially designed flotation aids, but in the end found that simple swimming floats worked better. "If you just put a thruster under the chair all the thrust is below the centre of gravity so you rotate," she said. "It was certainly more more acrobatic than I anticipated." She modified the heel plates so that they formed fins at the backs of her heels and re-drilled the rubber straps to attach her legs to the acrylic "wings" she needed to steer the vehicle. The addition of the second thruster and fin meant that the wings were no longer practical but she kept them for aesthetic reasons. The wheelchair also required a more robust seat to handle the pressure placed upon it during a performance. "I would love to create a version with hand controls - but I need my arms to be free for the performance," said Ms Austin. The wheelchair, which had patents pending and was as yet unnamed, was already in demand, she said. "We've had PADI [Professional Association of Diving Instructors] course directors and very experienced divers saying they would pay to hire it," she said. "The Oceanography department at the University of Plymouth, where I did a BA [bachelor of arts degree] in performing art, said it would make their courses accessible to students with disabilities." There is one problem with the wheelchair however - the frame is beginning to rust. Ms Austin says that ideally the next model should be made of titanium.